It's big in Asia. In fact, about 70% of all Pearl meat currently leaves Australian shores, destined for high end restaurants in Singapore, Japan, Shanghai and Hong Kong. There it is quick blanched, chopped and stir-fried into delicate, elegant dishes. The remaining 30% makes its way to fine dining establishments on Australia's east coast and to a handful of restaurants here in Perth and in Broome. Chefs who can get their hands on it and whose food cost budget allows (Pearl meat fetches over $100/kilogram) jump at the chance to work with such a prized ingredient. It is hard to get, which is why we don't see it appearing on ice at the local fish monger. Pearl meat comes from the largest oyster in the world, the Pinctada Maxima. Pearls from the silver-lipped pearl oyster, found in the coastal waters off Broome in the Kimberley, are highly sought after. In fact, the pearling 'industry' first started with settlers in the Pilbara region in the 1860s eventually moving to the shell laden waters of Broome. To learn more about the history of the pearling industry in the Kimberley check out the following website. Most importantly, long before the pearling industry, Aboriginal and Torres Strait Islander people used pearl and shells for ceremonial purposes and the meat as a food source for centuries. With recent approval by the State government for the construction of a multi species hatchery at the opposite end of Western Australia in Frenchman Bay, Albany, it seems the amount of pearl meat that may soon be available to West Australians will increase. Not only will this aid the economy and create jobs, it will boost export market potential and allow the meat to appear on more menus throughout the state. How exciting! Generally pearl meat is lightly tenderised before cooking. But, texturally it is not as chewy as Abalone (unless you overcook it) nor is it as soft as say, scallops. It has a minerally, fresh-from-the-sea taste to it which can take on light subtle flavours whilst still holding its own. The best way to cook it? Don't overcook it first of all. Unless it is being braised, thinly sliced pearl meat can be quickly seared in the pan for no more than 10 seconds each side. We like to serve it raw on RiverMint menus seasoned with native flavours including finger lime, bloodroot, native lemongrass and a touch of Geraldton Wax oil. It also works beautifully just flash fried with sugar snaps, mirin, Tamari and ginger. Or try braising sliced pearl meat slowly for 2 hours in a basil tomato sauce. If you would like to get your hands on some pearl meat, have a look at respected pearl farmers such as Clipper Pearls or Great Southern Shellfish. Otherwise, if you are in Broome why not check out the awesome Willie Creek Pearl Meat Cook-off, held annually as part of the Shinju Masturi Festival in September each year. 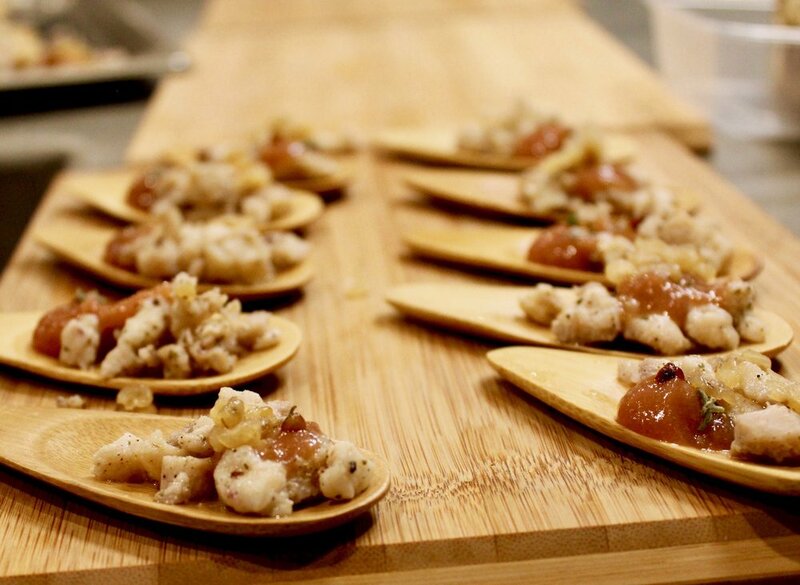 This year's winners from Matso's Brewery, served the pearl meat ceviche style marinated in lime and tequila and topped with champagne poached apple and spiced potato crisp. Delish!! 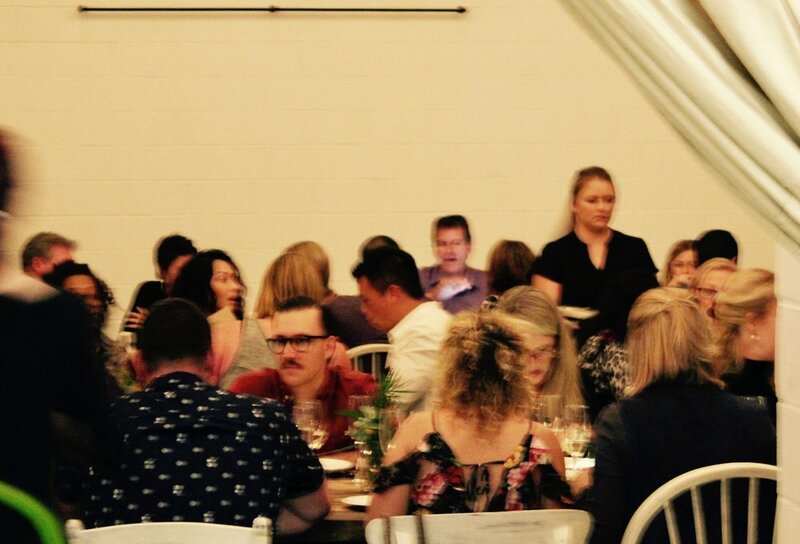 It was with gusto that we all readied the beautiful space at Salt and Company Cooking school in West Perth for the very first RiverMint Dining pop up. The menu and the evening were inspired by the Noongar season of Djeran, and the images presented by Salty Wings complimented the colours of the orange berries and banksias in season which were displayed around the room. The season of Djeran is also known as the Season of Adulthood and falls in what the western world regards as Autumn. A change in the wind can be felt, and hot nights are replaced with cool evenings and dewy mornings. Here we see the Marri blossom in full flower and Banksia flowers line areas such as the Roe highway and Herdsman Lake in abundance. Djeran is also the time when the emus are fat, so an emu flat rump was featured on the menu. This cut was marinated for 48 hours, cooked sous vide and then seared for service and served with a warrigal greens dumpling, fresh charred corn, rosella flower, pink berries and a game jus. Djeran is also the season of the salmon run, so it seemed only fitting to serve herring, after which the salmon run, as part of the canapés service. Combined with a native spice mix and potato, the herring potato bites were served with black garlic and ruby salt bush. 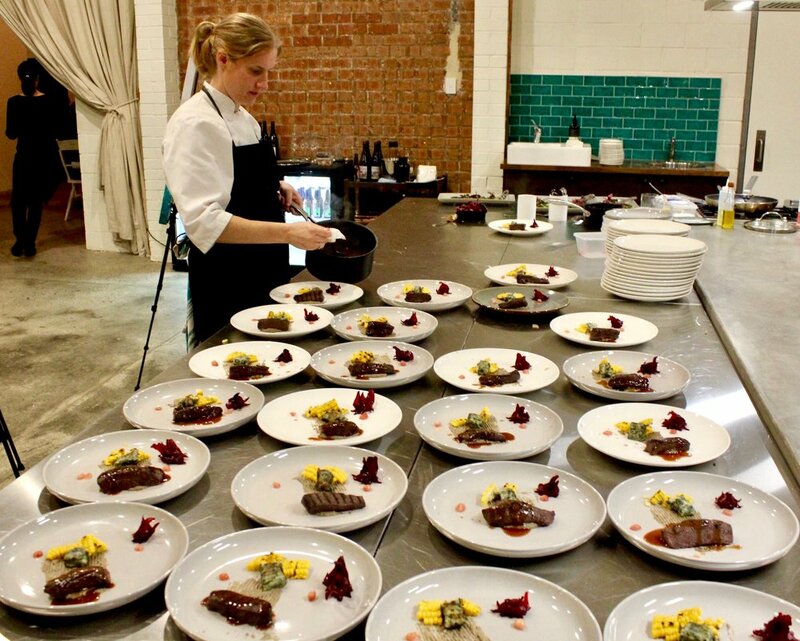 We also featured crocodile which was served at room temperature with a spiced rhubarb puree and gwarl berries from the Kimberley region (also known as White Berry Bush). Many greens were foraged for this pop up and included succulent pig face leaves, WA Samphire, dune spinach (also known as Crystal Ice plant) and sea rocket. These paired well with the seafood dish of smoked Kingfish, seared bush grapes and pepper berry and the zing of a favourite ingredient from Marvick Native Farms, fingerlime, cut through the smokiness. It was with pleasure that the River mint from our garden became a sorbet in between courses. The evening ended with a bavarois made using Pandanus nut, with Davidson Plum and Northcliffe Blood Plum. This was paired with Garbin Estate's Muscat. A tea made using Marri blossom flowers and Southern Forests Honey alongside WA Sandalwood nut bites completed the evening. We received plenty of feedback with regards to our first pop up and will endeavour to take all comments onboard when preparing for our Makuru pop up. Most importantly we learned a ton about the ins and outs of running a pop up restaurant and had fun in the process. If anything I would have liked to have spent more time outside of the kitchen and inside the dining room chatting about the ingredients that we should be celebrating as Australians. Thank you to all our suppliers for some great produce and to those that attended. 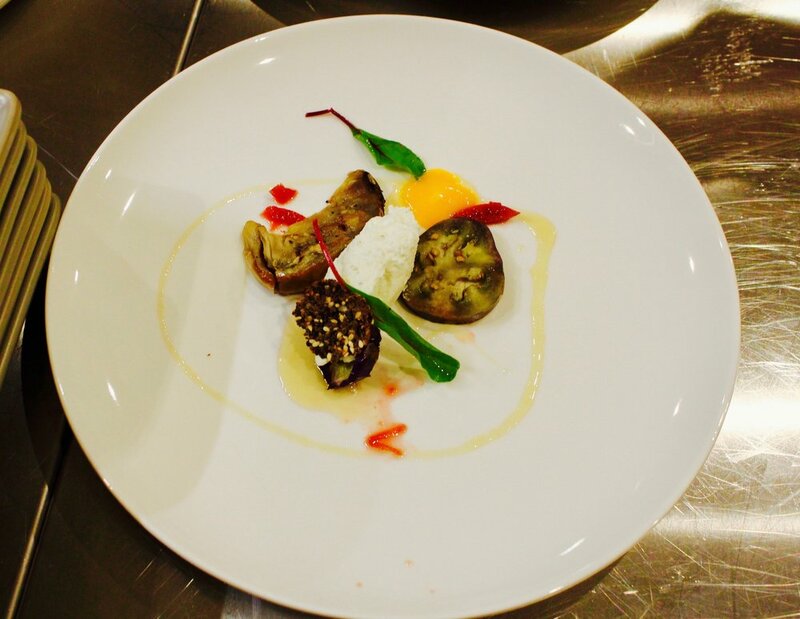 We look forward to cooking for you all again soon and will announce our next pop up in the weeks ahead.